The Sufferettes: Prigs in Space. The Sufferettes just wrapped up our very first-ever endurance improv show - 50 straight hours of large-ensemble adventure as part of The London Jam. What an interesting experience it was. What thrills! What madness! Set on the intergalactic cruise liner, Xanadu, we experience genuine manic hysterics, performed through perceptive hallucinations and galavanted around in a surprising wealth of actual good narrative and relationship. We were extra fortunate to end up in long narrative arcs with old pals Chris Craddock and Tess Degenstein and new pal, Alex Bartram. We could get into tales of the hijincks our characters (Dame Heave Garbage and Nurse Fart Garbage from the planet Shrit) got into, but really, it would not make much sense. Also, lots of it is gross. Huge thanks to Adam Meggido, Extempore Theatre and the entire production and support crew for making the festival and improvathon happen and inviting us into it all. 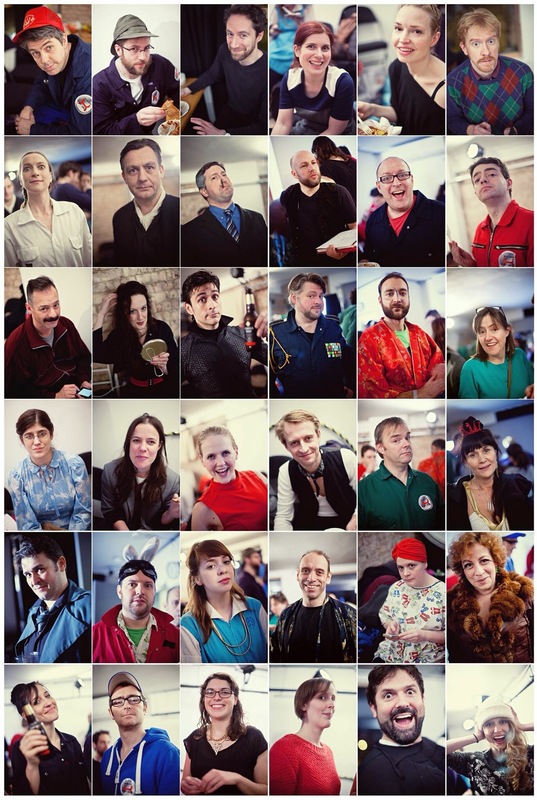 Also to the fantastic cast of improvisers, a great many of whom were unknown to us before our rendezvous in Xanadu. We were blown away! Pictured above is a collection of shots from the after party. This wasn't even close to the entire rotating cast for the weekend. Photos by Claire Bilyard, who also stayed up for most of the show to document our madness. Oh, and for those interested in purchasing either Kitten Juice or tickets to the space premiere of Pippen!, please email our sales rep at kittenpippen@cthulhu.co.au.